Techniques for Closure of Common Enterotomy of the Jejunojejunostomy During Gastric Bypass Determines Degree of Alimentary Limb Narrowing. Introduction: To date there have been several methods described for construction of the roux-en-Y jejunojejunostomy in gastric bypass surgery. Several case series report obstruction at this anastomosis because of inadvertent narrowing or acute angulation. Obstruction rates at the jejunojejunostomy have been reported from 0.5 to 2.2% and of patients presenting with bowel obstruction, 14% are at the jejunojejunostomy. In cases where the obstruction was due to a narrowed jejunojejunostomy the site of narrowing is at the closure of the common enterotomy. To date there have been no experimental series in an animal model comparing the dimensions of the two most common methods for construction of the jejunojejunostomy. Methods: Under IACUC approval, a porcine model was used to construct two types of roux-en-Y jejunojejunostomies: single staple line with end common enterotomy closure (double stapler method – DSM) and bidirectional staple line with central common enterotomy closure (triple stapler method -TSM). Once constructed the ends of the bowel were sealed and filled with Polyurethane self curing foam (GREATSTUFF ™ – DOW Chemicals) until all limbs and anastomosis were distended. After curing for 48 hours the overlying bowel was excised leaving foam cast models of the porcine intestines and anastomoses. The diameters of the alimentary limb as well as the narrowest and widest points of each anastomosis were measured. 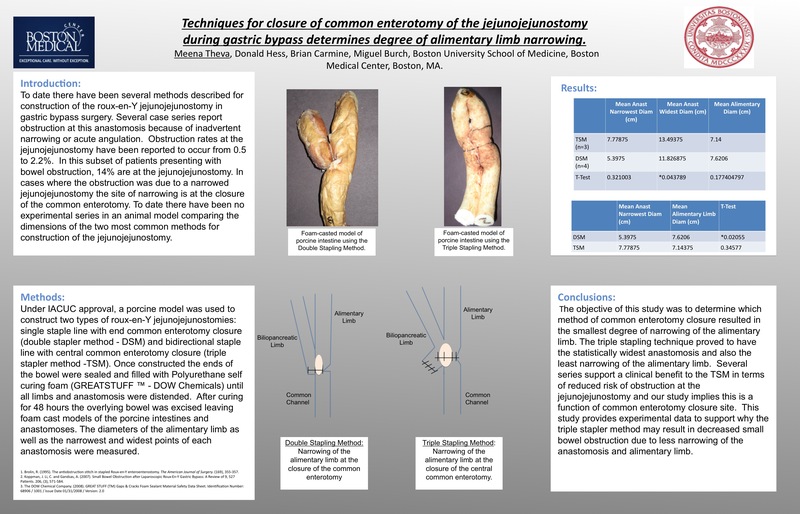 Conclusions: The objective of this study was to determine which method of common enterotomy closure resulted in the smallest degree of narrowing of the alimentary limb. The triple stapling technique proved to have the statistically widest anastomosis and also the least narrowing of the alimentary limb. Several series support a clinical benefit to the TSM in terms of reduced risk of obstruction at the jejunojejunostomy and our study implies this is a function of common enterotomy closure site. This study provides experimental data to support why the triple stapler method may result in decreased small bowel obstruction due to less narrowing of the anastomosis and alimentary limb.